That’s pretty darn good, peterigz, but does it scale down OK? I thought degac’s twin-tails thing for Monkey2 was clever, and makes for a visual double-take, a little more attention-grabbing than just… a normal monkey. If you scale down you can just go with the monkey and circle on it’s own, depends on the space you have to fit it in. Can’t say I’m that keen on the 2 tails, just looks a bit odd to me, I can’t tell if it’s one monkey with 2 tails or one in front of another. Something that’s always bugged me with the Monkey 2 logo is that the monkey is like the most basic monkey icon you can find heh. If you Google ‘monkey icon’ similar ones show up multiple times. I had created this character a few months ago to be used in a game but I decided to change the theme instead. 🙂 Now for me is unusable but if is needed somewhere else let me know. I like Adam’s logo, but the shapes behind it are unnecessary, and in fact work against the nice alignments he created between the text and the monkey (i.e. he’s walking on the same “surface” as the words are settled on). I also agree with Hezkore, a less “clip art” monkey would be welcome. Managed to make a super quick cleanup monkey drawing… styling is still kinda “meh”, and I just went along with the same “monkey walking from the side” idea (again, super quick), but hopefully feels more clean and distinctive. Yeah, the chin ended up looking like a nose (and the double chin like the normal chin! ), so it looks like he has a big nose and is sadly looking down… 🙂 Will fix when I find some time. P.S. I hope you don’t mind us… monkeying…with your logo. Here’s a more final version (the pink 2 removed for clarity in viewing) with attention being put into viewing at smaller resolutions. Still prefer the pink 2 adds a bit of character… we need an “official” version and a vector version. The font for the 2 was Mr Dafoe from google fonts btw incase you want to use it. For smaller icons I was thinking you could just write m2 as well.  Maybe it would be a good idea to start with the monkey logo and then work in a powered by. No other language includes it’s version number except for maybe Perl 6 so I question the validity of including a 2. Worst icon above (from a recent gltf support tweet) is in my view mozilla, hideous…. Most of those logos are for the company, not for a language.